New York Times – There’s one more big collection to go before the New York ready-to-wear season officially draws to a close and the style circus moves on to London, but unless something extraordinary happens (and it could, it always could; this is fashion, after all), Thom Browne just had the best show of the week. The kind of show that reminds you why there are shows in the first place, why we go — and why anyone should care. In his usual Chelsea art gallery basement, Mr. Browne built a woolen pastoral; an ice rink surrounded by barren trees and bulrushes, with boulders and penguins and an old row boat on the side, all of it covered in many shades of gray men’s wear fabrics: herringbones, tweeds, flannels and pinstripes. Then out walked four living lampposts covered head to toe in houndstooth, a globe in each hand. And an ode to tailoring began. At a time when challenging gender stereotypes is the watch-phrase of the day, the show on Wednesday was the smartest commentary on the subject yet — in part because it turned the issue on its head: Instead of putting men in women’s wear, it put women in men’s wear, simultaneously underscoring how much the antecedents are intertwined and demanding a reassessment of the suit. There was not a dress on the runway (indeed, a single-breasted mink jacket bore the message “it’s too cold for a dress” on the back). Instead, there were Bermuda-short suits and skirt suits and trouser suits, almost all covered by perfectly cut overcoats. There was nothing uniform or limiting about it. Within the frame of jacket, trouser, coat and tie, Mr. Browne invented legions. There were puns on the penguin suit — a.k.a. the tuxedo — in patent leather intarsia with penguin profiles, and stuffed-shirt tote bags (literally, shirt fronts with ties). There were inside-out collages that treated lining tulle as a scrim (a technique also adopted by Derek Lam, who included in his appealing “one-stop shopping” presentation louche pajama trousers, the print underneath cleverly veiled by a chiffon overlay). 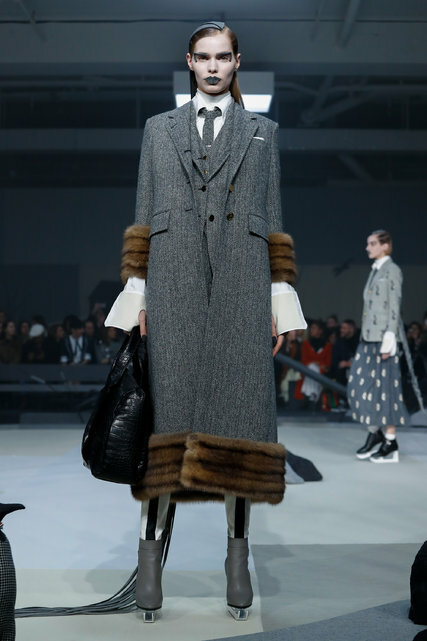 And there were intarsia farm scenes in furs, coats dripping fringe made of mother-of-pearl buttons instead of paillettes, and a wedding nondress finale featuring a bride in a short black puffer coat with a long black puffer train. There was a lot more.